Yes, I've got Switzerland on the brain. 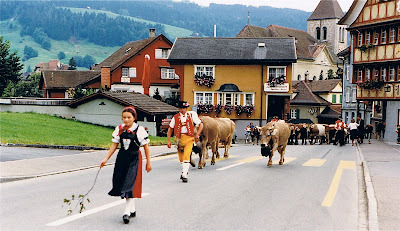 This is the town of Appenzell, during the ceremonial descent of the village cows in the fall. I love it and had certainly never heard of a ceremonial descent of cows! Do they spend the spring and summer grazing in the hills and then come down to winter indoors? And who is the young girl leading them? Exactly - they come down out of the Alps for the winter. 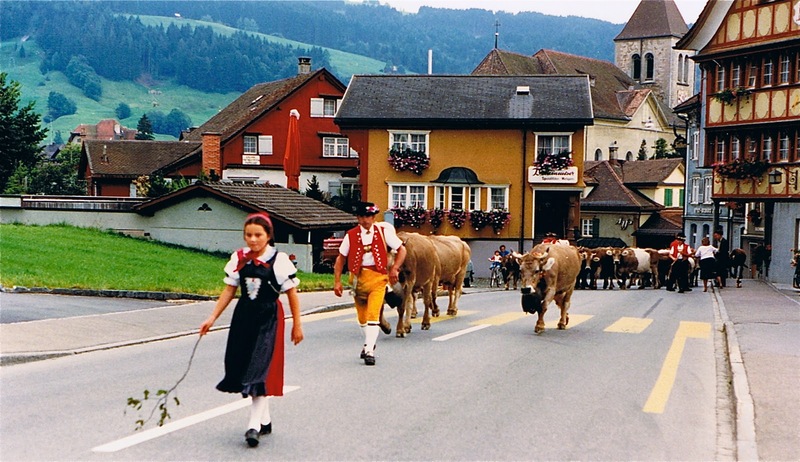 The processional ceremony is very festive, and the young girl is just one of the many villagers who participate in the parade and fun. I love that they've made it into a ceremony. That has to be one of the most original festive parades I've heard of. And certainly the best name! It looks fabulous though, thanks for sharing. What fabulous native costumes - makes me think of Heidi! Love the colors of the buildings in Switzerland. Makes everything seem so happy!...Except maybe the cows. They don't seem to enthralled with the descent.